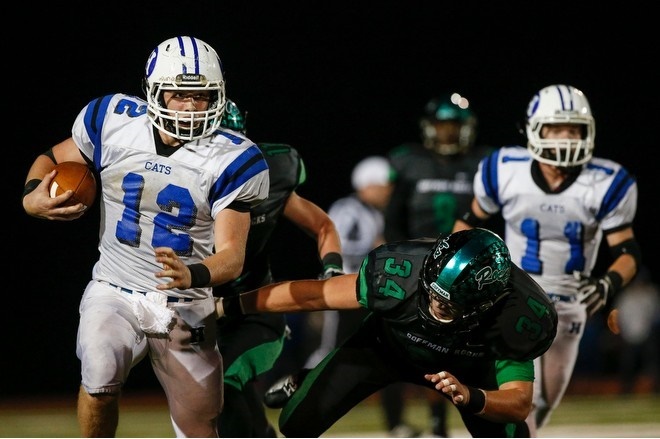 Hilliard Davidson coach Brian White has flipped many a game in his team’s favor with high-stakes gambling on fourth down that would impress even those on the World Poker Tour. White might have pulled off the biggest bluff of his career on Friday night by having a soccer goalkeeper run from punt formation deep in his own territory with the clock winding down in the fourth quarter. David Hoyle ran 23 yards for a first down on fourth-and-12 to enable the Wildcats to run out the clock and defeat Dublin Coffman 7-6 in an Ohio Capital Conference Central Division game at Coffman. Hoyle, who was tackled at the Davidson 48-yard line, smiled while talking about his newfound running ability. Davidson (6-2, 3-0) ran 14 plays on the drive, which ended with quarterback David St. Clair taking a knee at the 1-yard line. Royer never doubted White’s daring call. White said the fake punt was practiced all week. “I thought the kids had confidence in it,’’ he said. Davidson scored its touchdown on a 7-yard run by Royer with 7:14 remaining in the first half for a 7-3 lead. The drive went 86 yards on 13 plays. Coffman (6-2, 2-1) cut the deficit to a point on a 30-yard field goal by Jordan Drye with 2:13 left in the third quarter. He kicked a 31-yard field goal in the first quarter. The Shamrocks scored a touchdown on a 22-yard catch by Caleb Stoneburner before the first field goal, but it was nullified by a penalty for an illegal receiver downfield. This probably was a make-or-break game for the Wildcats with regard to their playoff chances in Division I. They sat in the eighth and final spot in their region. “I’d like to think this is enough to get us in the playoffs, but we still have to take care of business the final two weeks,’’ White said. Hoyle’s mad dash will be remembered for a while, but the defense that gave up only 172 yards to such an explosive team was a huge key. Shamrocks quarterback Drew Hodgson completed 12 of 15 passes, but they went for just 72 yards.